The word strategy is widely misunderstood and misused. The word strategy derives from a Greek word meaning “the General’s art”. The general’s goal is to win the war and to do so they control all armies to achieve this aim. Thus, strategy is defined as coordinating the whole to achieve a goal. From a business perspective, there is a problem with defining strategy in this way. The problem is it causes people to think that strategy is about competing to be the best. It isn’t. Strategy is about competing to be unique. If you’re in any way unclear about what exactly strategy is, and isn’t then read this article: What is Strategy? Strategy doesn’t exist in isolation. Before you create your strategy you need to collect information. This includes performing tasks such as analyzing your strengths and weaknesses, understanding trends within your industry, understanding trends outside of your industry, and understanding what your competitors are doing. Once you’ve collected this information, then you’re ready to put your strategy together. Finally, once you have crafted your strategy you’re ready to set up your organization to execute the strategy. This includes things such as what organizational structure you’ll use, how you’ll reward people, and what metrics you’ll track. 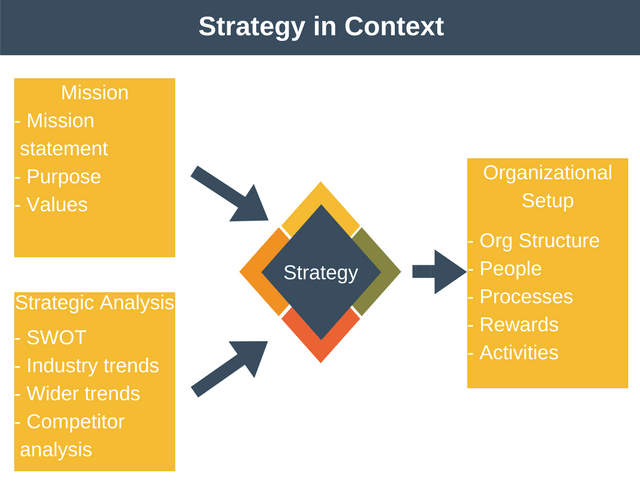 In a nutshell, how you’ll set up your organization to execute the strategy. It may seem as though some of the articles described in the Inputs to Strategy section help you to define a strategy. That’s partially true, they can help you to see the opportunities that exist within the competitive environment. But what they don’t do is help you to form an integrated and complete strategy. The Strategy Diamond Model is a great tool to use here. NB: You could link to something about strategic priorities here!!! Once you’ve crafted your your strategy you need to align your organization to execute your organization to achieve. This is described in the STAR Model of Organizational Design. How you set up the practical details of your organization to implement the strategy is covered in our Leadership collection of articles. On this page, we’ve covered just some of strategy related articles on this site. The complete list is below.